These are of necessity sequential activities, so the elapsed time for this process can be six months or more, from the initial survey planning to the final feedback to staff of success stories arising from their survey participation. Whereas there is nothing intrinsically wrong with the process, the way it is carried out means that the activities within the process only happen at selected times of the year. For example, survey planning might start in September, with the survey run in November, the results analysed over the holiday break, so that action planning can begin in January ready for a Spring launch of re-engagement initiatives, the results of which will be analysed in June ready for the results to be announced at a July all-hands meeting (or not!). Always-On Engagement (AOE) is a new paradigm for implementing the aforementioned process which removes this seasonality, opening up a new “degree of freedom” for HR’s and Internal Communication’s operational procedures. Rather than work on a dozen engagement projects at once, AOE says to spread them out over the year, and to support this model, also spread out the survey and the planning. Effectively, all the stages of the process are happening all the time, but each instance of the process will be focused on a specific initiative. For execution, this means carrying out a sequence of smaller, more targeted projects as resources permit, but year-round. Spreading out the planning is also relatively easy; just hold more frequent, maybe monthly, meetings to consider and plan for dealing with whatever is the most important issue of the moment. But how can the annual survey support this model? Its data, against which planning is done, will grow increasingly outdated as the year proceeds. There are two ways of approaching this. One is to retain the annual survey, but also carry out more frequent pulse surveys, which are often smaller or have restricted participation. This certainly freshens the data from time to time, but there is an innovative new type of survey specially designed for AOE, and that is (perhaps slightly obviously) the Always-On Survey. 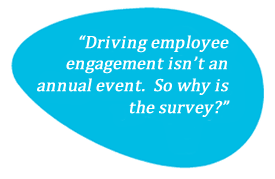 This survey lets employees change their views whenever they like, so the analytics can be followed in real-time, and undesirable trends can be spotted early and dealt with before they become serious problems. Adding the time dimension has additional benefits: you can see how a section of the company’s opinions on a given topic have changed over any period of time. This makes it easy to gauge employees’ responses to things like reorganisation announcements, and provides a perfect sentiment-monitoring tool for any company going through change. AOE is not yet mainstream in the HR community, but the concept has many benefits and no appreciable drawbacks, so its widespread adoption is probably just a matter of time. Indeed, its adoption is paralleled in the IT industry, which has largely abandoned the old rigid “Waterfall” model for developing large software projects in favour of an “Agile” approach whereby the software is built in small chunks by dedicated teams and project flexibility is crucial. AOE effectively brings an Agile approach to the task of engaging employees, and the Always-On Survey is needed to support that approach.